Experts around the world are continuing to speculate on what caused the world’s stock markets to plunge over the last few days, beginning with the New York exchanges last Friday, and attempting to explain where they’re headed over the months ahead – and why. Among those who’ve been commenting, and who – as usual – has been rather less upbeat than many of his commentating colleagues has been Paul Gambles, managing director of the Bangkok-based MBMG advisory and wealth management group. 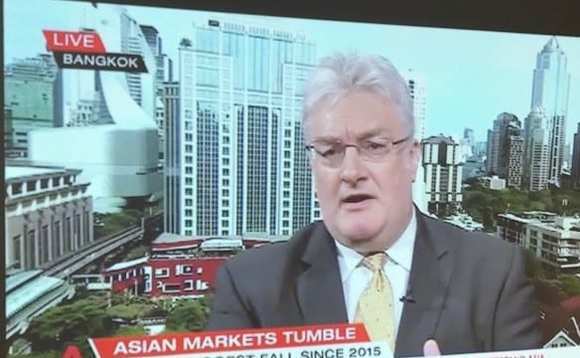 As European markets opened yesterday, he was invited to share his market outlook views with Channel News Asia, with whom he’d shared his concerns the previous week, just before the global markets swooned. Below is an edited transcript of his on air comments yesterday, given in answer to the Singaporean cable television news agency’s question: Is this the beginning of the major market downturn many market bears have been predicting? Paul Gambles: “We’re not convinced that this bout of volatility is more than a tantrum that could presage a prolonged wrestling match between agents trying to prop up the markets, and forces weighing them down. “We’re surprised that the Nikkei was allowed to fall as far as it was before apparent intervention which helped the regional markets to rally. “We’d expect to see a floor form in the US markets, which will give the rest of the world the cue for any attempted rally, which could then lead to a wrestling match for most of the rest of 2018. “[It would require a] break significantly below a 22,000 close as an indication that we could be further into the bear market. “The ultimate bear market could imply a Dow Jones Industrial Average anywhere between 2,500 and 22,000, and even a multi-decadal recovery – Great Depression Redux. 1) We think [the big downturn] is most likely some way ahead. Tech started this downdraft (e.g. Apple Inc), and may be a sign as to whether any bounce is sustainable. 2) Inflation is nonsense – there’s no valid evidence yet – the data implies more of a deflationary bust, and policymakers are still fighting the wrong dragons (which is why their misguided policies are having such a negative effect – the reaction to the latest US employment release was bone-headed; it implies deflation, not inflation). 3) I never believed three hikes this year (and definitely not four); – if the FOMC [Federal Open Market Committee] have any sense, they’ll row back rate any hike expectations – but they don’t. So who knows what they’ll come up with next. 4) Asian central bank policy is in response to US – once the US eases, Asia can ease, but by then the damage may be done – it may already be too late to avoid hurting the emerging markets. 5) No change in our portfolio positioning – which has generally been exceptionally profitable across all risk benchmarks so far this year – except even more aggressive US dollar and US Treasuries – two themes that were already under way. “For equities, we’ve long been saying that protection makes sense, and we’re keeping that in place. “Having called the short term equity top and US Treasury and dollar index spot lows, we’ve been pretty flat on our equity portfolios, and nicely ahead on fixed income and currencies over the last week, after a very solid January. “Not betting the farm on any specific outcome, but trying to guard against negative ones has allowed us to achieve solid gains well within risk and volatility targets across the spectrum so far this year. “It’s likely that we’ll continue to hedge bets in this way. Gambles told International Investment today that forming a “top” in the world’s equity markets could be a protracted process, and that, while “it doesn’t seem to be time to panic just yet, as evidenced by the rebound in markets”, he believes caution is advised, as “global assets are still over-priced, and the case for them to remain even at their current levels isn’t there”.